I am a coffee girl. I need just one cup in the morning for my senses to fully awaken. I recently started grating Mexican chocolate into my latte. One thing lead to another and I came up with this little cocktail. The combination of Mezcal, cardamom and bitter chocolate is amazing. Sweeten condensed milk seems to be rather intense out of the can, but I can assure you one tablespoon balances each flavor out. This is a great cocktail for an afternoon pick-me-up. Personally, I am looking forward to pre batching them for a chilly Forty-niner game at Candlestick Park. Mix together coffee, cardamom and Mexican chocolate. Put into a coffee filter and enough water to brew one cup of coffee. Brew coffee. Fill cocktail glass with boiling water, let sit for a minute to warm up the glass –then empty glass. Stir Mezcal, sweetened condensed milk, and bitters together. Add coffee and stir again. 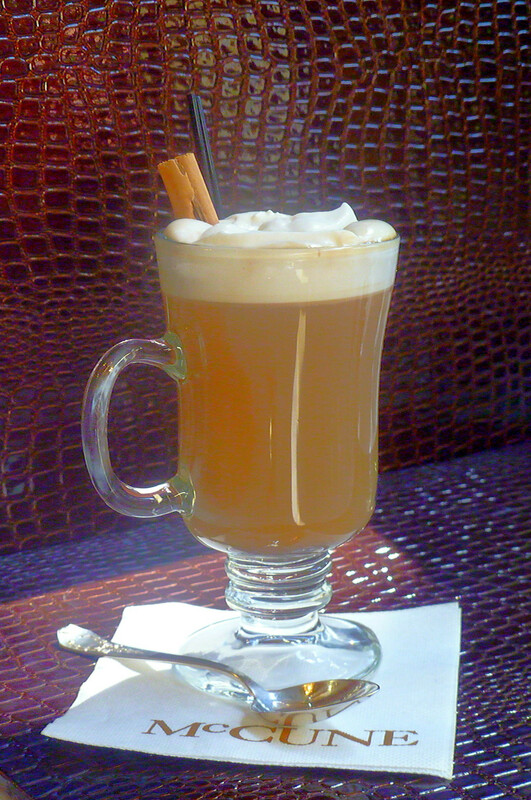 Top with steamed milk or a dollop of whipped cream and a cinnamon stick.